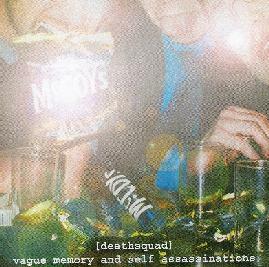 Deathsquad - "Vague Memory And Self Assassinations"
Vague Memory and Self Assassinations, Deathsquad’s debut full-length CD from 2001, has been re-edited, re-mixed, and re-mastered for re-release and displays the group in its embryonic state, exploring the possibilities of lo-tek soundcraft through aural violence and underground politics. Like their German counterpart, Atari Teenage Riot, Deathsquad pursue the sonic equivalent of ars brut stripped to its skeletal framework. In this sense, Deathsquad’s methodological nihilism as applied to the practice of sound construction can also be likened to Metal Urbain, Dome, and early Chrome. Though varying widely in structure, content and production, the sixteen songs that comprise Vague Memory and Self Assassinations all reveal a willingness to experiment with sound itself, particularly as a conduit for ideological expression. The group’s anarchic politics are given full vent, for instance, on "Hundred Year War" and "Flag of Convenience". Harsh electronic soundscapes, noise collages and spoken-word rhetoric coalesce into grim sonic shock therapy on both pieces. "Let Them Eat Crap" (apparently a pun on Marie Antoinette’s haughty remark—"Let them eat cake"—to the French peasantry) is a wry metaphor for pop culture’s colonization of the European subconscious. "Corporate Daughter" effectively shows that when they want to, Deathsquad can rock out with superindustrial fire. Here Lord Blade’s power-chorded phase-shifted guitar rides shotgun with Thug D’s acerbic vocals over a thoroughly incendiary backdrop of electronic effects and tech noir drumming. Similarly, "Weekend Armchair Warfare Fan" seethes with the paranoia of latent urban terror: distorted vocals, icy goth-styled keyboards and a malevolent bass line provide the appropriate vehicle for a descent into the underworld of the disenfranchised lumpenproletariat. "Enter Cyclops" is a brief impromptu jam of Hendrixian guitar shredding and stochastic drumming that leads into the oddly somber "Life Kills", a piece reminiscent of Throbbing Gristle’s more danceable and melodic synth-driven vignettes. As an initial document, Vague Memory and Self Assassinations shows that Deathsquad had — and still has — important things to say about things that are important. Contact via snail mail c/o Nick at Stray Dog; 113 Eton Rise; Eton College Road; London; NW3 2DD; England.